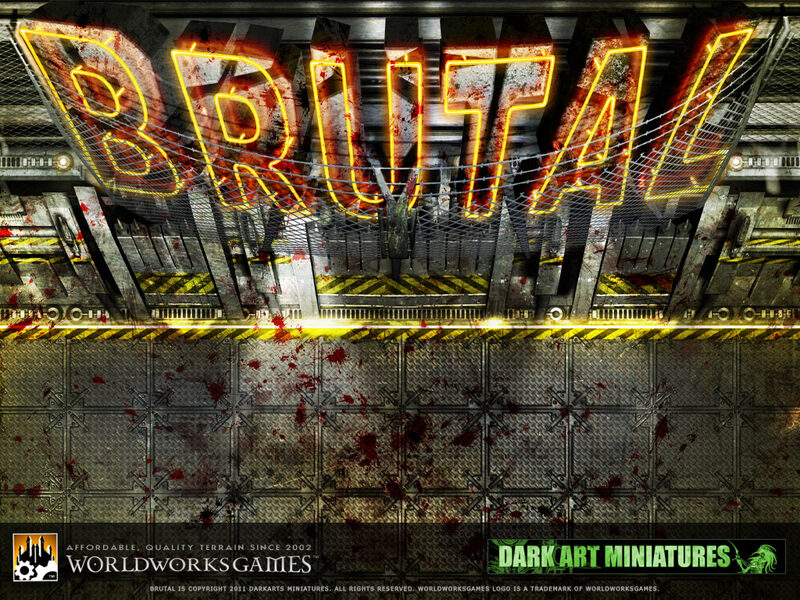 WorldWorksGames • View topic - What is Brutal? Post subject: What is Brutal? I've seen it on the main page in the development section. I searched the forums but got nothing... can anyone illuminate me? Futuristic Gladitorial Combat -WWG/Dark Arts and is using a SciFi set logo. Other than that, there hasn't been any info that I know of. The year is 8000 in the post apocalyptic world of Perspicuus Gemma (bright gem). What was a world of beauty has been replaced with wasteland and twisted metal. Destroyed cities have given birth to new way of life. Most of the human-kind now live underground in vast cities filled with arcane devices and machinery. Many things have changed but human nature will always seek ways of preoccupying one's thoughts of reality….to forget one's own worries and to feel better with ones self at another’s suffering. One thing’s for sure….. whether you’re a true human or a mutant, everyone enjoys a good old smash um up on the vid-screens! Entertainment at its best…….Brutal is here! You are the owner (Lanista) of a troupe of fighters and you hire out your services to any that will pay your price for the ultimate in entertainment, violence in its truest form. Many Lanista follow the same path as you but only one can claim the rights to the lions share. Brutal is a stand-alone board game that allows you to pit fighters against one another in an up-close-and-personal-combat-system set in a post apocalyptic world. The system is primarily a duelling system although any amount of players can take part which makes it great for tournament play. This is a highly tactical game with the element of chance so if a player makes unwise moves or actions then expect a quick death…..unless you are lucky. Like a real life combat situation, the more you understand your abilities and that of your enemy the more chance you have of reading and bluffing your opponent which will help you beat the opposition. The game mechanics of brutal simulate this without being bogged down with too many rules and without the need of a bucket load of dice, which has got to be a good thing right! The game incorporates Action cards which forces players think and play differently than they normally would with other strategy miniature game which brings a refreshing change to miniature gaming. By the time you have had a couple of fights you will see the need to develop different strategies against different types of fighters. You might also want to try out the other playable races. Don’t feel disheartened if at first your fighter seams to die within 5 turns or less (I know some sweet, killer combo moves). This will often be the case if playing against an experienced opponent or just plain bad luck. Once you get more experience your fights will last much longer. Once you are happy with the core rules you can then move on to the additional rules covered in the book ‘The bloodied, bruised and broken’ which covers rules for players to create their own troupe bought from the slave markets. It also contains league/ campaign rules which include fighter development and gifts allowing your fighters to rise amongst the ranks of the brutal fighters. Alternatively, Denny/WWG is doing the textures for the next release of Brutal or their downloadable game pack. looks like an expanded version of one of the missions in necromunda. Futuristic Gladiatorial fights. downloading it now. might have a go at it. A scifi TLX ArenaWorks would be pretty cool, and would make for splendid scifi dungeoneering opportunities. Heh, had an urge to answer 'It is Ritalin, wrapped in a misery, inside an enema, hey that sounds pretty Brutal to me....' But then I am still punchy from lack of sleep and the fumes from spray primer. Nullum magnum ingenium sine mixtura dementiae fuit. It's pretty clear to me how a high-quality texture pack and licensing the TLX (or possible TerraClips?) system would be beneficial to the company. They need to put in some work redesigning their website - it looks like a fan site circa 1999 or so. In the downloads section they have a basic beta pack that includes the rules and an arena. Again, it's pretty easy to see how WWG's experience in this area would benefit them. I'm looking forward to the release as basically an expansion for Titan - it's pretty easy to see how this terrain would fit in with a Gamma World campaign. The idea of a release specific to one thing and yet so broadly usable is a good one. 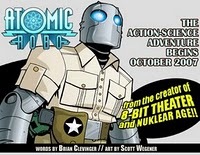 If it is similar to the Pathfinder and Wyrd connections, I am sure that it will be awesome. This may not be so compatible with titam for a simple reason. Titan is 25-28mm scale and Brutal appears to be a 32mm scale game. That is sizing on the Mini's at any rate. As a side note, Dark Arts has some awesome themed model bases. Any news on this, or a teaser at least? The first wave of Brutal production is nearing completion. In the short-term our focus is getting this product completed to spec and into a box (tangible not PDF). I can't wait to get my hands on this one! It might revive our bi-weekly board game nights. tangible Woot Woot. Now I'm interested. Oh, I was hoping this would be a pdf product that was flat tiles. Guess not Oh well, I'll still buy it! Will the tlies be suitable to other sci fi games? Or is this terraclips? Error, no keyboard - press F1 to continue. WWG was commissioned by DarkArts Miniatures to create the board, cards and tokens which make up the game. This is not a TerrainlinX or TerraClips related product but it is slated for tangible/retail release. oh HELLZ YES! Im in for this one. Ohhh more minis to paint! and they look cool too!! The game is not something I'd play, but I'm looking forward to seeing what the WW art looks like. hmmm, might have to wait on this one until I know more about it. With WWG quality textures it's gonna look good though! Looks Great! i really hoep this becomes a reality soon. I'm gonna pick up the minis with my tax return. Post subject: Re: What is Brutal? Any new on this project. Seems to have died. The game is good fun and I am hoping you can get it finished. I've just come across this and it does indeed look like a great game. A touch of WWG magic would definitely see me trying this out. "Hey, look! A Dungeons and Dragons ride!" Yeah...over a year since first discussion; it would be great to know if this is still happening. "Two men enter - one man leaves!" Any news on this Denny? Last you had mentioned it was close to release but that was almost a year ago. I haven't heard anything for ages. This was a subcontracted bit of work for us so we haven't been very close to the nuts and bolts of its roll-out. You can likely find more info at the DarkArts website. thanks Denny! Great customer service and personalized attention as always! Luv u guys!